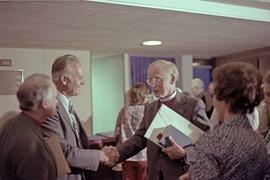 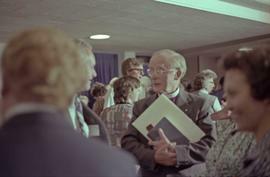 Photograph depicts Archbishop of Canterbury Donald Coggan talking to Cyril Shelford and others in Terrace. 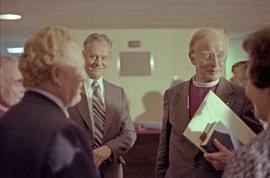 Photograph depicts Archbishop of Canterbury Donald Coggan talking to Cyril Shelford, Bishop Hambridge, and others in Terrace. 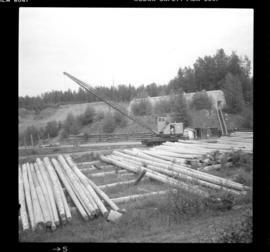 Photograph depicts a private crane in a private pole yard adjacent to mile 3.5 on the Skeena Subdivision, on the western outskirt of Terrace. 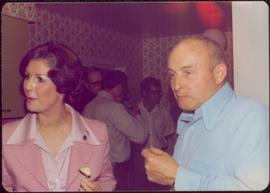 Photograph taken about halfway between Terrace and Prince Rupert. 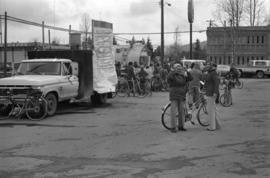 The Skeena Subdivision (from Terrace) was about 400 yards long and was used for avalanche protection. 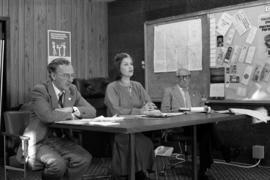 It was abandoned in the 1950's as it was deemed too expensive to maintain. 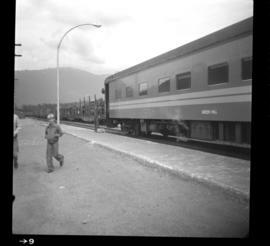 Photograph depicts a westbound VIA train of 4 passenger cars and 1 baggage car. 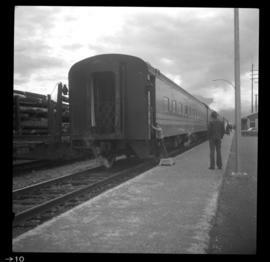 Photograph depicts a VIA Rail westbound Prince Rupert train that ran daily in the summer. 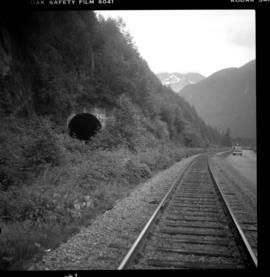 Photograph depicts a VIA Rail westbound Prince Rupert train. 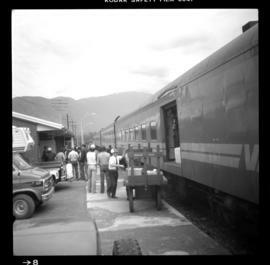 Photograph depicts the arrival of a westbound Prince Rupert train. 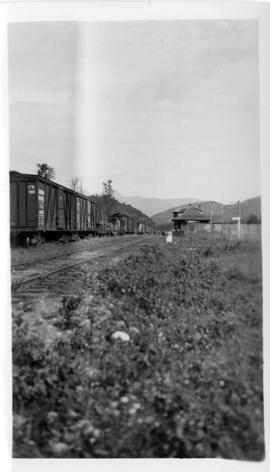 Photograph depicts the Dorreen railway station on the Canadian National Railway main line, located on the west bank of the Skeena River between Cedarvale and Terrace, British Columbia. 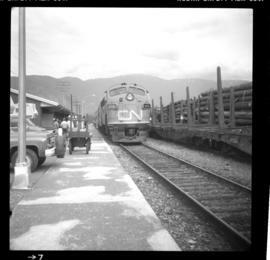 CN boxcars visible on the siding. 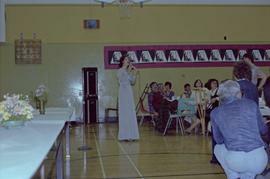 Photograph depicts First Nations children wearing button blankets while performing at a community banquet held at a Terrace school. 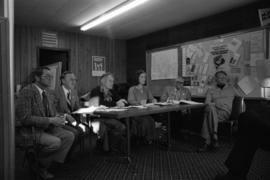 Photograph depicts MP Iona Campagnolo sitting next to Jack Talstra, future mayor of Terrace, at an unknown location in Terrace, BC. 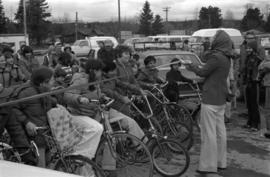 Photograph depicts Iona Campagnolo and an unknown female biker near the map for the Terrace bicycle race. 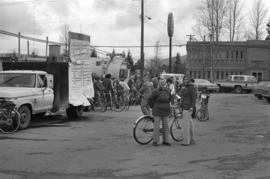 Photograph depicts Iona Campagnolo and an unknown female biker near the map for the Terrace bicycle race and starting line. 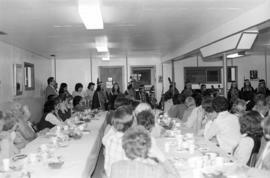 Photograph depicts Iona Campagnolo and others watching First Nations children perform at a community banquet at a Terrace school. 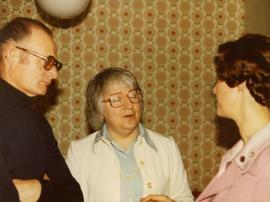 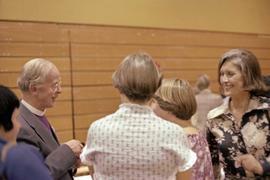 Photograph depicts Iona Campagnolo and two unknown women talking to Archbishop of Canterbury Donald Coggan in Terrace. 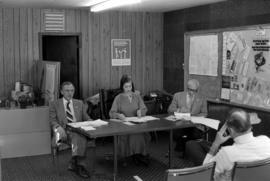 Photograph depicts Iona Campagnolo at a table with Vic Walton and John Blake during a meeting with disaster officials in Terrace. 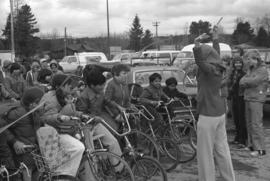 Photograph depicts Iona Campagnolo standing at the starting line at a children’s bicycle race in Terrace. 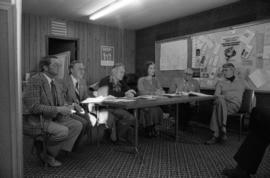 Photograph depicts Iona Campagnolo at a table with Vic Walton, John Blake, and three unknown men at a meeting with disaster officials in Terrace. 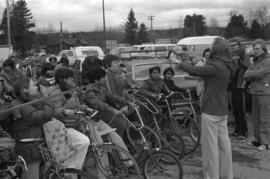 Photograph depicts Iona Campagnolo cutting the ribbon to start a children’s bicycle race in Terrace. 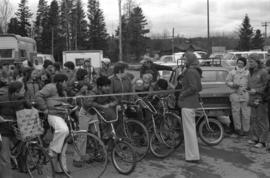 Photograph depicts Iona Campagnolo after cutting the ribbon to start a children’s bicycle race in Terrace. 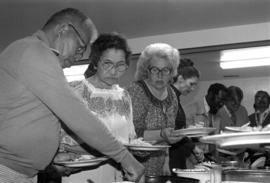 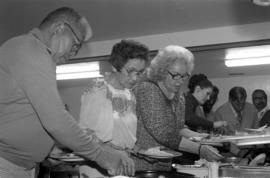 Photograph depicts Iona Campagnolo and others filling dinner plates at a community banquet at a Terrace school. 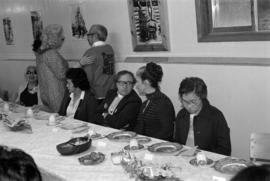 Photograph depicts Iona Campagnolo with others filling plates at a community banquet at a Terrace school. 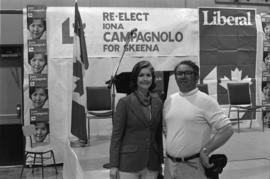 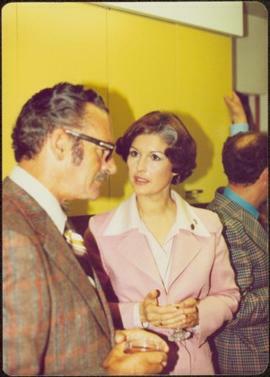 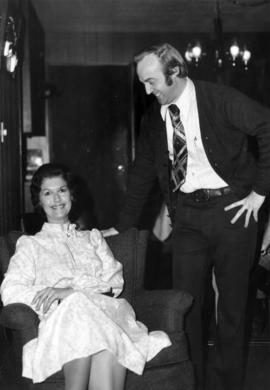 Photograph depicts Iona Campagnolo posing with an unknown man in front of a podium for her Liberal re-election campaign. 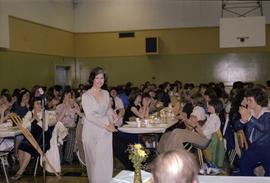 Photograph depicts Iona Campagnolo sitting at a long table at a fundraiser for Terrace Independent School in Terrace, BC. 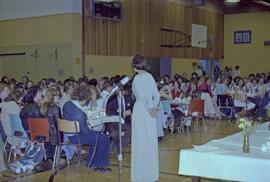 Photograph depicts Iona Campagnolo addressing constituents at a community banquet at a Terrace school. 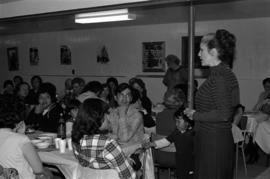 Photograph depicts Iona Campagnolo speaking to constituents at a community banquet at a Terrace school. 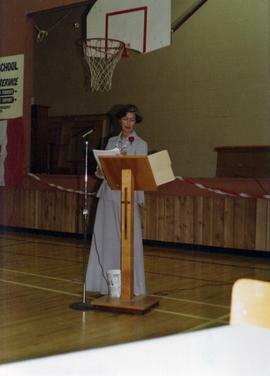 Photograph depicts Iona Campagnolo speaking at a podium at a fundraiser for Terrace Independent School in Terrace, BC. 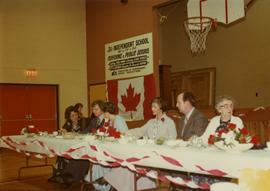 Photograph depicts Iona Campagnolo while sitting at a table and speaking with a constituant at a banquet for the community held at a Terrace school. 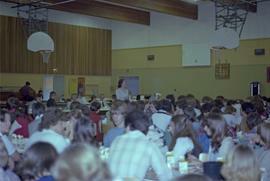 Also present at the table is Nadine Sante. 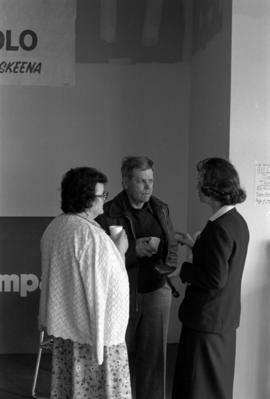 Photograph depicts Iona Campagnolo speaking with two unknnown constituants at the grand opening of the Liberal office in Terrace. 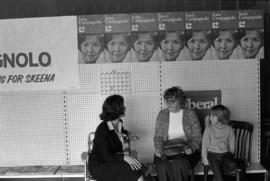 Photograph depicts Iona Campagnolo speaking with an unknown woman and child at the grand opening of the Liberal office in Terrace. 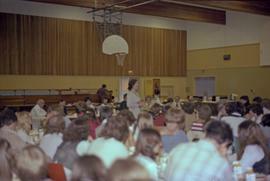 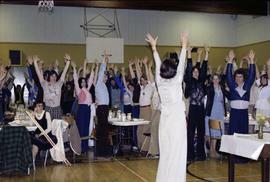 Photograph depicts Minister Iona Campagnolo speaking to a crowd of unidentified young adults at the Caledonia Secondary School gym during the Terrace Theater Festival. 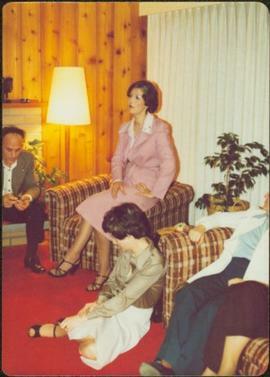 A table behind Campagnolo is set with flowers. 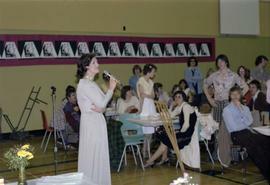 Photograph depicts Minister Iona Campagnolo standing and speaking to a crowd of unidentified students and young adults at the Caledonia Secondary School gym during the Terrace Theater Festival. 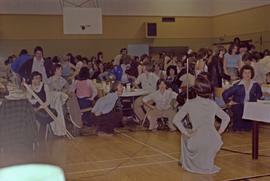 Photograph depicts Minister Iona Campagnolo standing and speaking to a crowd of unidentified young adults at the Caledonia Secondary School gym during the Terrace Theater Festival. 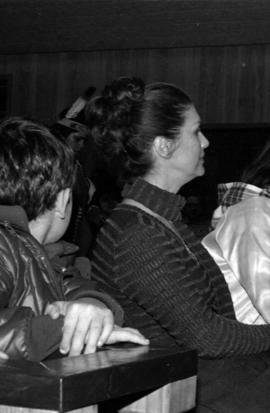 The young adults are seated and clapping. 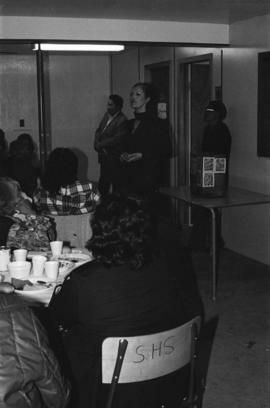 Photograph depicts Minister Iona Campagnolo standing and speaking to crowd during the Terrace Theater Festival at Caledonia Secondary School. 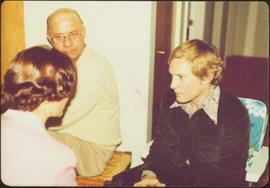 A banner stating "Kermode Theatre '78" hangs in the background. 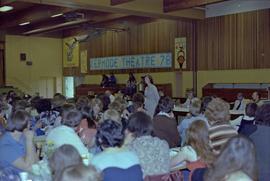 Photograph depicts Minister Iona Campagnolo standing and speaking to an unidentified crowd of students and adults during the Terrace Theater Festival at Caledonia Secondary School. 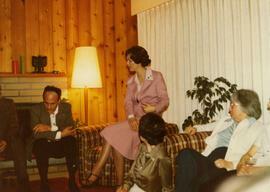 Photograph depicts MP Iona Campagnolo talking to people attending her "Living Room Speech" in Terrace, BC.